Checkpoints are marked on a topographic map; how many can you find before time runs out? Whoever collects the most points and finishes in the fastest time wins! Navigation racing is old school: no GPS gadgets, just a paper map, your wits, teamwork, and a ton of fun! It has been several years since our last visit to this area, at the eastern foot of Rattlesnake Ridge. We’re planning this event in a mass-start, Goat format, where all competitors will do the same basic course, but with extra credit checkpoint options. We’ll have some new terrain and a new set of checkpoints for you in the forested trails, boulder-studded slopes, ridges, and valleys of this area on the northern border of the Cedar River Watershed. Participate solo or in a team of 2-5 people. Are you new to nav racing? That’s okay! Check out the “First Time?” section to learn how it works. Be sure to show up to the free Introduction to Navigation session on event morning! We’ll provide an introduction to the map, reading contours, basic navigation, and how to use the compass to orient the map. Online pre-registration closes Thursday, April 13 at 11:59pm. This event will feature a Goat format, in which all competitors start at once and visit checkpoints in numerical order. Like at our other nav race events, ranking will be according to highest score then time, so anyone who otherwise follows the rules will receive a finish place, regardless of the number of checkpoints they visit. The basic course will be defined by a skeleton of a relatively small number of high-value checkpoints, and additional checkpoints will offer opportunities to improve your score, as time allows. The event designations, 3-hour and 6-hour are used to determine what time cutoff will apply. If you register for the 3-hour event, then it means you must finish by three hours after the start or face a steep point penalty. If you sign up for the 6-hour event, then it means you have until the course closing time, six hours after the start, before point penalties start to accrue. The amount of the course and number of checkpoints that you complete will depend upon your fitness, your navigation skills, and which event you sign up for. Additional special rules for the course will be announced at the briefing when the maps are distributed. Many of the highest value checkpoints will be located in such as way as to present a beginning to intermediate level of navigation challenge to find them. However, the most direct or fastest routes will often involve advanced level skills. The additional checkpoints beyond the highest value ones that define the basic flow of the course are often of a higher difficulty level. Following a more skilled competitor can help (and following is an explicitly allowed and encouraged strategy), but you should be prepared to carry on and at least be able to find your way back to the finish using your own skills, in case you become separated from others. Following other competitors is expressly allowed and is a part of the race strategy. You must not enter private yards or any areas marked as out-of-bounds on the map. If you’re not sure how to tell what is marked out-of-bounds, then please ask before the start. You must carry a whistle. Three short blasts in quick succession is the distress signal that you should use if you are injured, lost, or otherwise need assistance. Once you check in for the event, you must check in at the finish before leaving the event site, regardless of how much of the course you complete or whether you care about your official result. This is a safety precaution that prevents us from spending resources looking for you if you are not lost. These rules may be added to or modified closer to the date of the event, so check back for more. If you have a Discover Pass, please park in the Iron Horse State Park lot and follow signs to the Snoqualmie Valley Trail extension (across the road from the lakefront picnic area) to check in. 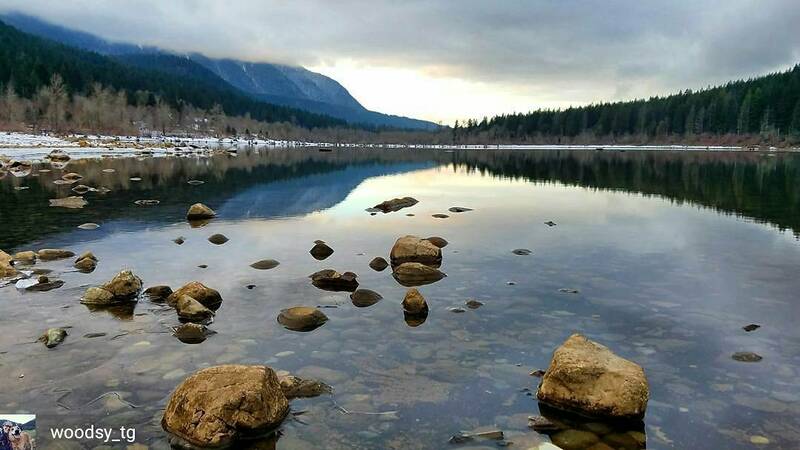 You can also park in the Rattlesnake Lake Recreation area lots – follow signs to the Snoqualmie Valley Trail extension to check in. April 15 is a Discover Pass-free day at state parks! Depending on your carrier, you may not have cell reception at or while approaching the park. Traction shoes, especially those with dobb spikes, or shoes to which you can attach micro spikes, are highly recommended, if the conditions are wet or snowy (as is fairly likely at the higher elevations.) Shoes with less traction increase the chance of slipping and falling. Layering your clothing is recommended to accommodate changing weather conditions throughout the event. Watch the weather forecast, and consider the effects on your comfort and safety of cooler temperatures in the higher elevation parts of the course, changing weather, and possible exhaustion. If you are used to participating in long races, then you understand the importance of drinking and eating enough, and of replacing electrolytes when you sweat profusely or for long periods. If you are less experienced, then we urge you to carry a hydration bladder or bottle, some snacks (up to a couple hundred calories per hour), and some electrolyte tablets/capsules or beverage (unless it is quite cool and you have a low sweat rate.) Because there is a navigation element to this event, and because it takes place in rugged terrain, there is an increased chance that you will be out on the course longer than you think, so it’s best to take a bit more food than you think you will eat. Participants are responsible for their own safety while participating, and the organizers are neither qualified nor equipped to render medical care in the event of a serious injury. In case of an emergency, call 9-1-1. You are encouraged to bring a cell phone with you as a safety precaution, if you wish. There may not be cell phone signal over parts of the course.